Cashel bog in Co. Laois is locally known as a source of peat moss for farmers and gardeners. 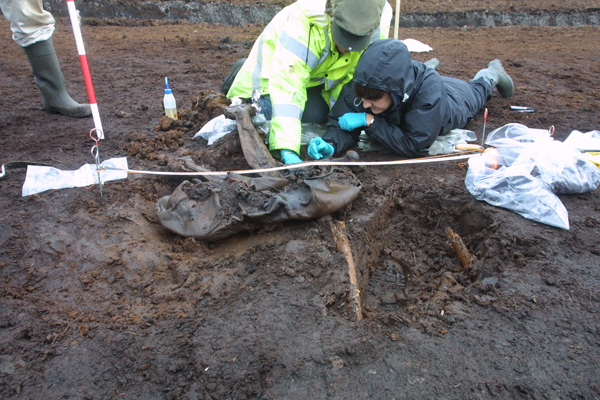 But recently the peat millers harvested something rather more unusual: an Iron-Age human sacrifice. Dubbed ‘Cashel Man’, the adult male was found lying on his right side, knees tightly bent up, in a position so contorted that initial reports interpreted his torso as a ‘leather bag’ from which legs were protruding. The figure is complete from the shoulders down, although the milling machine that uncovered him also removed his head. However, his face (apparently with short-cropped hair on the scalp) and parts of his lower jaw and teeth have since been recovered. Eamonn Kelly, Keeper of Antiquities at the National Museum of Ireland, who has been examining the remains, said Cashel Man was deposited in the bog around 2000-2500 years ago. Cashel Bog lies on a district boundary two miles from Crosdubh Hill, an ancient place of assembly. This location is similar to other Irish bog bodies who are thought to have been deliberately killed for ritual purposes. 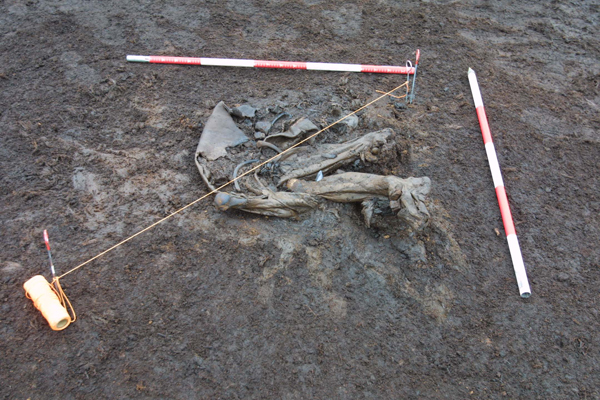 Previous investigations at Cashel bog have uncovered three post rows, two of which are dated to AD 640-780, as well as a Neolithic platform from c.3780-3640 BC. Artefacts including a flint arrowhead attached to a shaft, a leather bag and a shoe have also been recovered. Cashel Man’s remains were moved into chilled storage immediately after discovery and constantly sprayed with water to mimic the conditions that helped preserve them for over 2000 years. A detailed programme of tests will include anatomical and pathological examinations, as well as X-ray and CT scans and carbon dating. Analysis of his hair could shed light on his long-term diet, while food residues in his stomach will show what he ate for his last meal. Ultraviolet light will reveal whether Cashel Man had any tattoos, while the peat that surrounded will be analysed for traces of body paint — both of which could provide clues to his status. Past analysis of the remains of two other bog bodies, Oldcroghan Man and Clonycavan Man, suggested that they had been important individuals as they were well-nourished and their hands and nails showed no sign of having performed physical work. When these tests are complete, Cashel Man will be conserved for inclusion in the National Museum of Ireland’s bog body exhibition, ‘Kingship and Sacrifice’.